Got Skills? Teach your passion at Detroit Public Schools Community District. You love what you do. Sharing that love can translate into a lifelong career for a DPSCD student. Teach your passion as a highly-qualified, experienced, industry-trained professional and help us put our students on the pathway to success. Current instructional openings include welding, robotics, CNC machining, culinary arts, IT, construction trades, agri-science, health sciences, business management, finance, automotive services, aviation, broadcasting, and radio/TV. 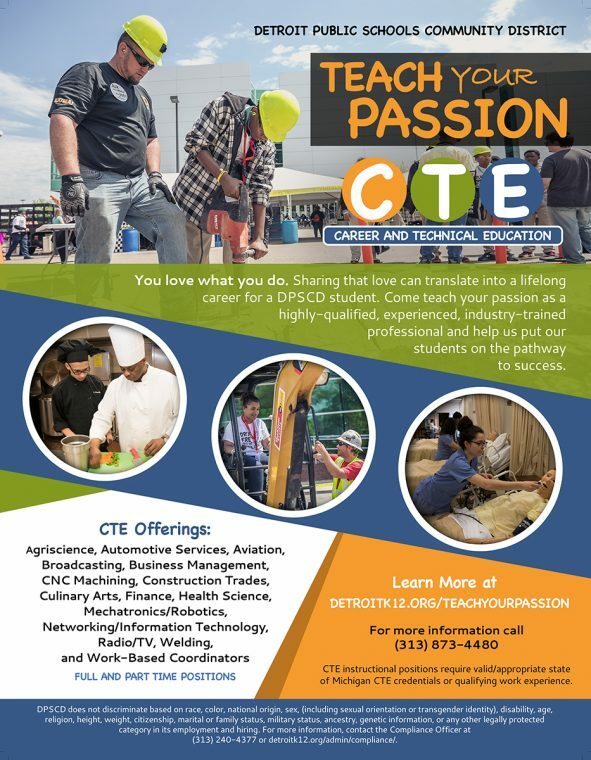 All CTE instructional positions require valid/appropriate state of Michigan CTE credentials or qualifying work experience. For more information call (313) 873-4480.